You guys! I’ve been eating so much squash lately, that I’m kind of afraid I might start to turn some bizarre shade of orange. But as my friend Sherrie said to me earlier in the week “some people pay good money to be that color”. So I guess that is the upside to my dilemma. I blame my obscene levels of squash consumption on my Mother. Because I asked her to bring me a couple delicata squash from the farm the other day, and she brought me twelve. So I’ve been on a steady diet of squash ever since. Delicata squash has been a favorite of mine for a while now. It has a mild nutty, sweet flavor. It cooks up relatively quickly (at least compared to some other squashes). And you can eat the skin once it’s been cooked. Which is awesome because I’m lazy and I don’t like to peel things. So there you go. I’ve used roasted delicata squash “half-moons” as a sandwich topping before, and I wanted to re-visit that idea here. But this time, focusing on a purely vegetarian option. So I slathered warmed sandwich-sized pita breads with fresh guacamole. Then topped them with black beans, pumpkin seeds, roasted squash and a few sprigs of fresh cilantro. Then I proceeded to shove three in my face. They were that good. 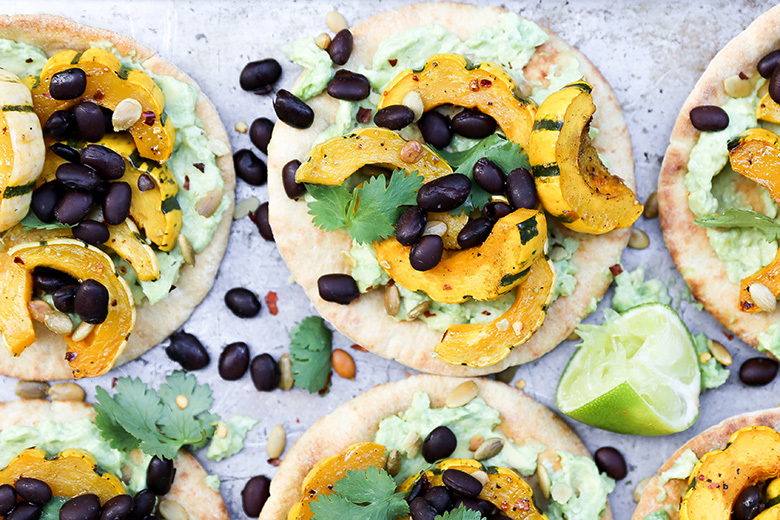 These Roasted Delicata Squash Pita Tostadas with Black Beans and Guacamole come together very quickly, which makes them a great choice for lunch or an easy weeknight dinner. Try them out and then come back here and tell me about how much you loved them! Oh and do you want to know what my secret ingredient is for making the guacamole so incredibly yummy? It’s goat cheese. I simply mix a couple tablespoons of softened goat cheese in with the avocado to give my guacamole a wonderful creamy texture. Here I used a honey-flavored goat cheese from Laura Chenel’s that I’m currently obsessed with. But you could certainly used any plain or herbed goat cheese that you love. If you wanted to make this recipe gluten free, swap out the pita bread for corn tortillas and have yourself a little Fall taco situation. Sounds delightful to me. 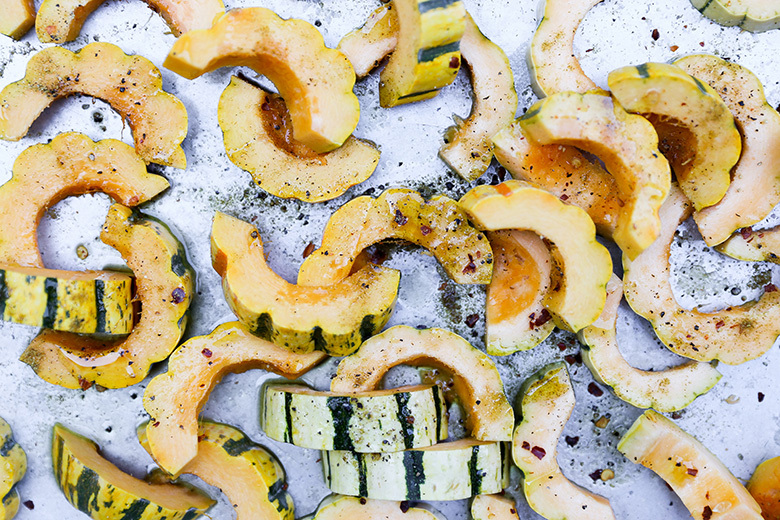 Trim the ends off the delicate squash and then slice them in half lengthwise. Scoop out and discard the seeds. Then slice the squash into 1/2-inch thick “half-moon” slices. Add the squash to a large rimmed baking sheet and drizzle with the olive oil, tossing gently to coat. Then sprinkle with the salt, black pepper, cumin and red pepper flakes. 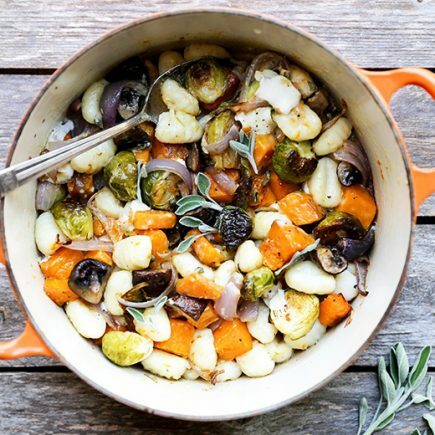 Transfer the baking sheet to your pre-heated oven and roast the squash for 18-20 minutes, gently stirring once halfway through cooking time. Remove from the oven and cover to keep warm. Meanwhile, place the pita breads on a second rimmed baking sheet and warm them in your oven for about 10 minutes, or until the edges turn slightly crispy. To make the guacamole, slice the avocado in half and remove and discard the pit. Scoop out the flesh into a clean bowl. Add the goat cheese, lime juice and salt. Then mash everything together with a fork until well combined. To assemble the tostadas, spread the guacamole in a thin layer over the warmed pita breads. Top with 4-5 slices of the roasted delicata squash, a heaping tablespoon of black beans, a sprinkling of pumpkin seeds and some fresh cilantro. Serve immediately. Well this is brilliant and I HAVE to start buying squash when I go to the store today! Also, why haven’t I eaten it on a pita before? This is perfect! dude. i am obsessed with delicata as well. and when i was writing the book, i swear i did turn slightly more orange. lol. 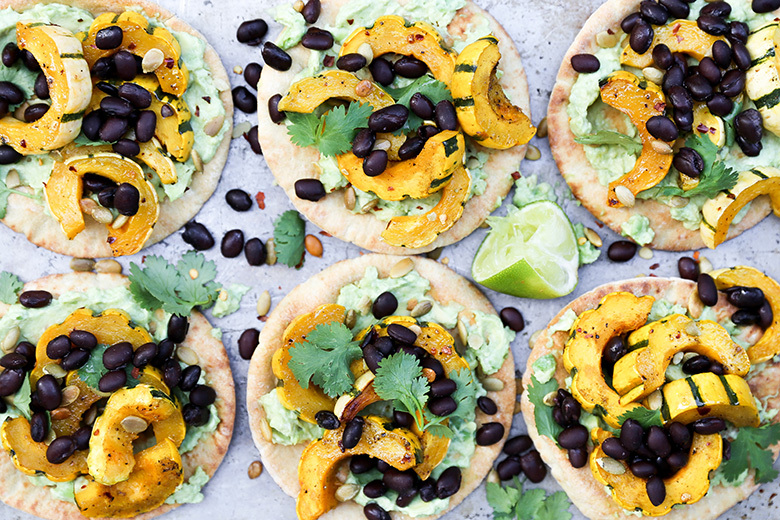 fun idea to make these pita tostadas! I made these tonight and they were amazing! Pretty crazy how delicious something so simple can be! I did used roasted butternut squash I had on hand but this could only be better with delicata! 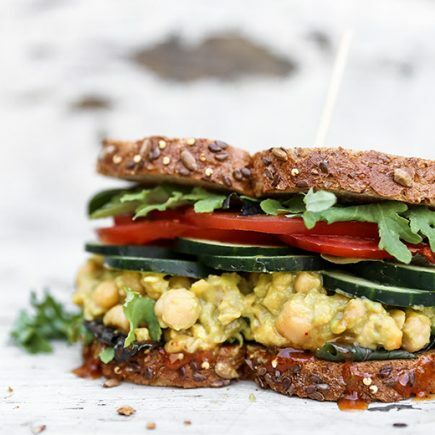 I also used a combo of chickpeas and lentils that were in the frig and it was so good! So glad you tried them out, Nikki! And your changes sound delicious – I’ll have to try that next time myself!